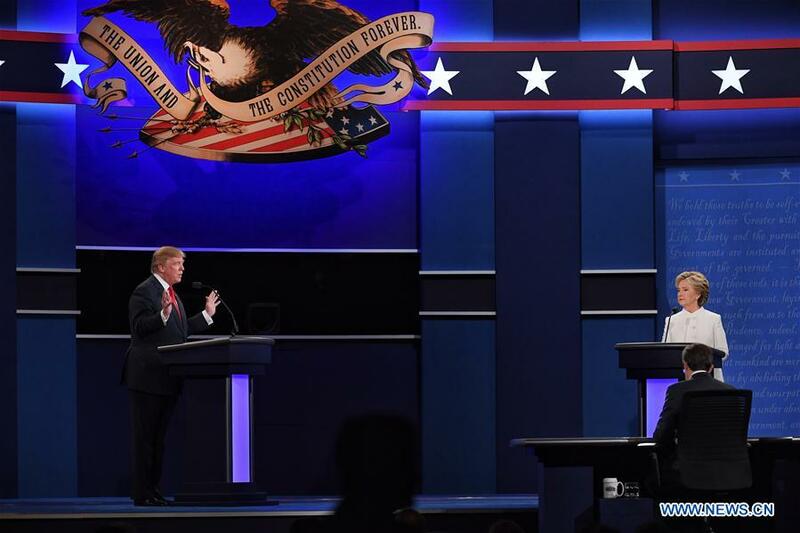 WASHINGTON, Oct. 25 -- The ongoing 2016 U.S. presidential campaign has garnered extensive global attention as it enters the home stretch, with both candidates focusing energy in digging each other's dirt rather than devising solutions to dire challenges facing the country. From the party conventions, which officially announced their respective nominations, to the three widely-watched TV debates, Hillary Clinton and Donald Trump have relentlessly hurled personal insults at each other, as the public laments that the U.S. presidential politics has descended deeper into the gutter. While Trump labeled Clinton as a liar and openly called her a criminal, Clinton seems to have spared no effort to blast Trump for dodging taxes and being sexist and racist. The constant stream of scandals and the pervasive smearing campaign made the 2016 election campaign even racier, rekindling debate that if the United States really lives up to its self-claimed reputation as the "model of democracy." Negative campaigning is not a new phenomenon in U.S. presidential politics, but it usually appears in the final phase of a competition, especially when the two candidates are in a close race, said Daming Diao, a researcher from the Institute of American Studies, the Chinese Academy of Social Sciences (CASS). Mudslinging tactics dominate this year's presidential campaign because the ongoing race for the top U.S. job is basically a showdown between two least-welcomed candidates, Diao said. A Gallup poll released before the third and final presidential debate found that neither Clinton nor Trump is particularly well-liked. Only about half of those who view either candidate favorably say they have strongly favorable views. By contrast, most of those who have unfavorable views of the candidates say they are strongly unfavorable. "This reinforces the idea that for many voters, the 2016 election is a choice between 'the lesser of two evils'," Gallup said. There are also deeper reasons for the omnipresent debasing between the two candidates, Diao with the CASS said. Rising political polarization and widening partisan divide determine that neither candidate could be able to present a policy package that is feasible or acceptable to the public, so they choose to solidify their own position by undercutting each other, he said. In his amateurish touch on policy issues, Trump said if elected, he would build a wall along the border with Mexico to deter inflow of illegal immigrants, and he would also rip up free trade agreement as part of his strategies to bring back jobs to the United States. Such measures, which may sound like what it takes to "restore the greatness" of the United States, actually defy common sense and could hardly achieve their intended goals. Meanwhile, Clinton, despite her rich experience in politics, has so far appeared to play safe on policy issues, offering only vague ideas in apparent bid to avoid backlash. Indeed, the most difficult domestic challenges facing the United States, including rampant gun violence and gaping socioeconomic disparity, are results of decades of complex interaction among policy makers, interest groups, and the public, and it is no easy task finding a cure for such malaise. That said, there's no excuse whatsoever for the two candidates to simply shy away from policy issues and slide further into their carnival of slander, failing expectations of millions of U.S. citizens and beyond.